Vishwa Ayurveda Parishad (VAP) was established in the year 1997, to reinstate the Glory of Ayurveda in the present era and to facilitate the acceptance and recognition for Ayurveda. It is in a relentless effort to provide a credible platform to the scholars & followers of Ayurveda, which can potentiate it’s authenticity to wider audiences. 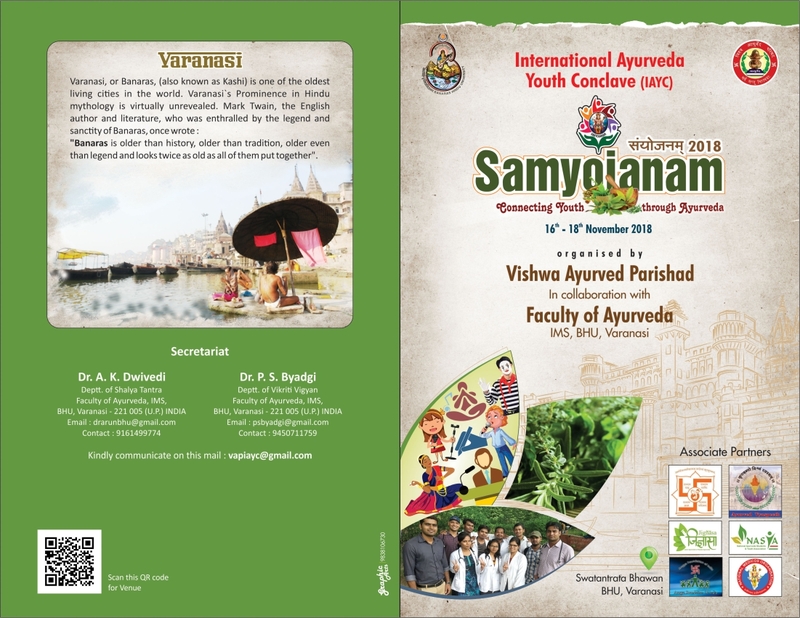 VAP is happy to announce its upcoming event – Samyojanam 2018, (International Ayurveda Youth Conclave – IAYC), in association with Faculty of Ayurveda, IMS, BHU – with an intention to connect the youth of all the disciplines of this science across the globe to provide a common platform to flourish their innovative thoughts in various fields of healthcare. This mega event is scheduled to be organized from 16th to 18th November 2018. The estimated participants are approximately 2500 from every nook and corner of the country & abroad. 1. To provide a platform for the youth of Ayurveda to show their talent and hidden potentials with different kind of fun & learning experience. 2. To explore the ancient wisdom, culture and knowledge. 3. To develop a scientific temperament for it’s application for the welfare of mankind. 4. 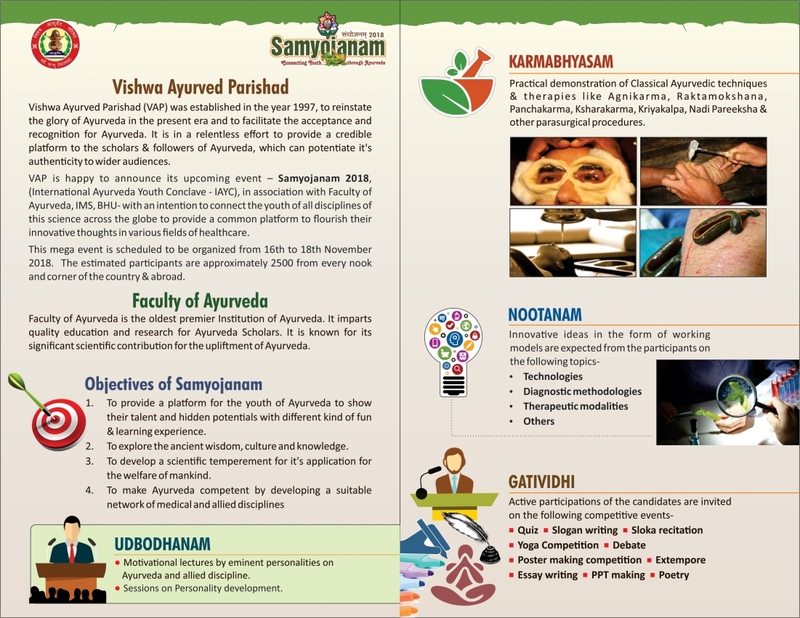 To make Ayurveda competent by developing a suitable network of medical and allied disciplines. Practical demonstration of classical Ayurveda techniques & therapies like Agnikarma, Raktamokshana, Panchkarma, Ksharakarma, Kayakalp, Nadi Pareeksha & other para-surgical procedures. 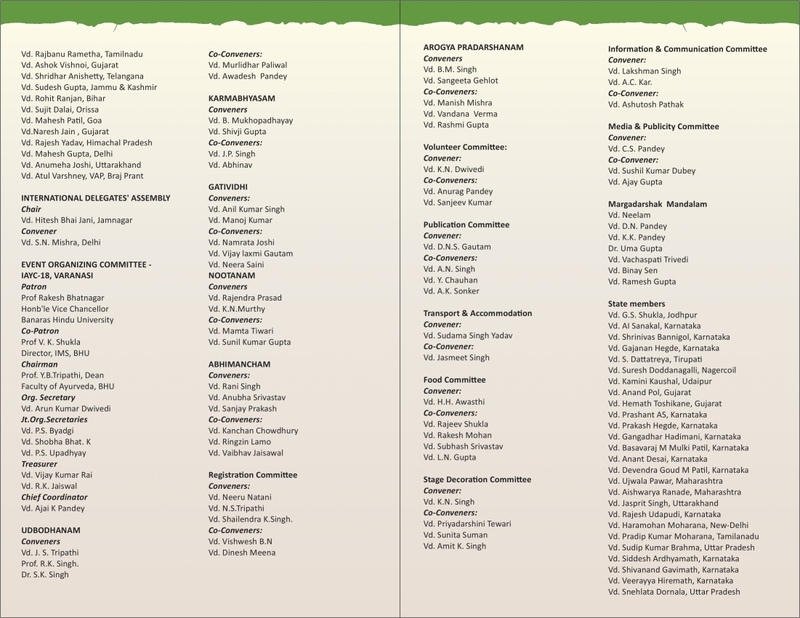 1.Motivational lectures by eminent personalities on Ayurveda and allied discipline. 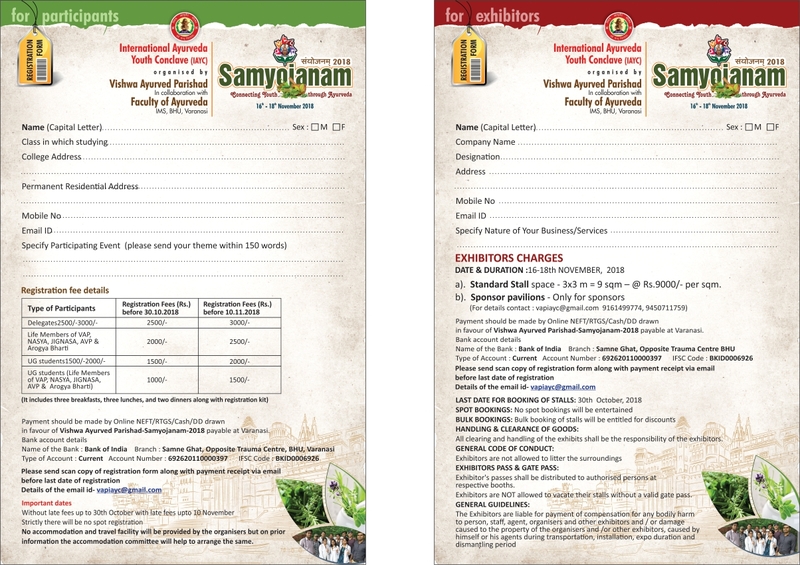 Creates awareness towards application of Ayurvedic principles in day to day life. Educates common man about the use of medicines / therapeutics obtainable from natural resources.